Fort Mill, SC – February 6, 2015. 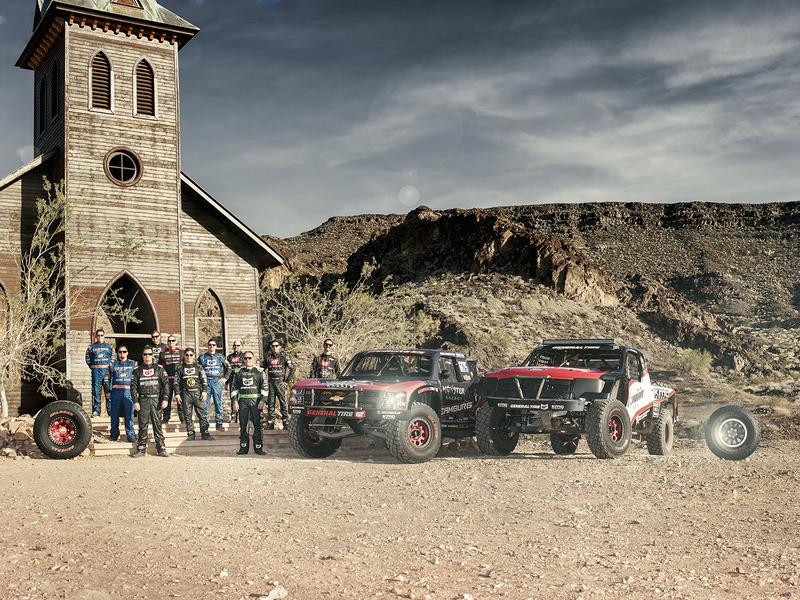 Celebrating 100 years in 2015, General Tire is taking the celebration to the deserts of the southwest with their Team GT lineup for this year’s Best In The Desert (BITD) series. The Team GT driver lineup debuts this weekend in Parker, AZ at the “Parker 425” and the efforts are led by top-contending teams poised to claim championships in their respective classes. Leading the way in the 1500 Class are three teams capable of dominating any desert on the schedule. C.J. Hutchins returns and is looking to add to the win column while Harley Letner looks to build on his Blue Water win in the final race of the 2014 season. Chase Motorsports also returns with drivers, Mikey Childress and Travis Chase, behind the wheel. In the Trick Truck class, Jim Beaver will carry the flag for General Tire as he sports a new paint scheme and a hunger for a win. Team GT leads the way in experience in the 6100 Class with veteran teams, Camburg Racing and Azunia Racing. Jerry Zaiden and Jason Campbell will pilot the Camburg Chevrolet with additional drivers along the way. Jim Riley continues behind the wheel of the Azunia Racing Ford and will sport a new red, white and black paint scheme in celebration of General Tire’s 100 year anniversary. Look for both teams to make a statement in 2015. Two KC-HiLites-sponsored trucks return to the Team GT lineup in 2015. Veteran, Randy Merritt, returns in Class 7200 competition and is hungry for a win. In Class 8000 action, Macrae Glass will look to continue his string of championship titles and race wins. In 2014, Glass navigated the rugged hills, washouts, sharp rocks, and twists and turns of the southwest deserts for 12 consecutive races with no flat tires proving that once again, the durability of the GRABBER is second-to-none. If you’re counting, that’s 4,300 miles. Marc Burnett will also sport General tires in the UTV Class for a full-season of competition. As if this lineup wasn’t stout enough, Team GT continues their partnership with Banning Motorsports and their distinguished list of sponsored teams. General will also continue as a sponsor of Jeep Speed and TrophyLite. Born from competition, Team GT vehicles will race on the signature Red Letter GRABBER’s, which provide the durability, grip and comfort needed to navigate the variety of terrain presented to these teams across the southwest. In fact, it was current team member, Mikey Childress, who tested the first GRABBER tires before the tire was adapted in competition and then introduced to the public. The 2015 season looks to be a great one as Team GT’s robust lineup provides plenty of opportunity for wins and championships. Look for our 100 year logo throughout the 2015 BITD season and help us celebrate 100 years and tell us about your adventure on General tires using, #GT100. For 100 years General Tire has offered a complete quality line of ultra-high performance, passenger, light truck, off-road and commercial tires to meet all your needs. General Tire is a proud supporter of Lucas Oil Off-Road Racing Series, Best in the Desert Racing Series, Major League Fishing, Chili Bowl, Pro-Pulling, Late-Model Dirt Series, Drag Boat Series, World Cup of Softball, American Sprint Car Series, FreestyleMx.com Tour, Zero One Odyssey, and Spec Tire of Trophylite and JeepSpeed. Team GT supports off-road and short course teams including Jim Beaver, Mikey Childress, Travis Chase, CJ Hutchins, Doug Fortin, Harley Letner, Jim Riley, Macrae Glass, Randy Merritt, Ray Griffith, Ryan Beat, Carl Renezeder, Robby Woods and Camburg Racing. Continental develops intelligent technologies for transporting people and their goods. As a reliable partner, the international automotive supplier, tire manufacturer and industrial partner provides sustainable, safe, comfortable, individual and affordable solutions. In 2014, the corporation generated preliminary sales of approximately €34.5 billion with its five divisions, Chassis & Safety, Interior, Powertrain, Tires, and ContiTech. Continental currently employs approximately 190,000 people in 49 countries.